The country's biggest telecom firm Bharti Airtel reported larger than expected drop in consolidated net profit for the quarter ended September 30 as forex losses, jump in interest costs besides mounting losses in DTH business and lower segment earnings from enterprises business and telemedia services weighed heavy on its bottomline. Consolidated net profit was down 38.1 per cent at Rs 1,027 crore for the quarter as compared to Rs 1,661.2 crore in the same period last year. Consolidated revenues rose 13 per cent over the year ago period to Rs 17,276.4 crore for the quarter ended September 30. Consolidated EBITDA rose 13 per cent to Rs 5,815 crore. Sequential net profit declined 15.5 per cent even as total revenues rose marginally by 1.7 per cent over the quarter ended June 30. Sunil Bharti Mittal, CMD of Bharti Airtel Limited said, "India has achieved double digit growth fuelled by non voice businesses. The arrest of continuously declining prices in India augurs well for the telecom industry. Africa has notched up strong revenue growth of 23 per cent." Bharti Airtel scrip rose 1.38 per cent to close at Rs 397.95 a share on Friday. Some analysts attributed this to the change in M&A norms in the telecom sector. Total mobile services revenues rose 14 per cent to Rs 14,485.9 crore in Q2 FY'12. Interestingly, this was led by over 20 per cent rise in the revenues from its African mobile services business that it acquired from Zain. This was almost twice the growth in India & South Asia where mobile revenues grew 10.9 per cent to Rs 9,782.7 crore during the quarter over the year ago period. Passive infrastructure services which is another big revenue contributor saw 10 per cent growth to Rs 2,376.6 crore while enterprise services unit reported 6.3 per cent increase in revenues to Rs 1,104.1 crore. DTH business revenues jumped 85 per cent to Rs 313.4 crore but telemedia services business saw 5 per cent decline in sales during the quarter compared to same period last year. Earnings from mobile operations rose just 4.3 per cent even as earnings from its African business rose almost three times to Rs 376.8 crore compared to Rs 135.3 crore in the year ago period. 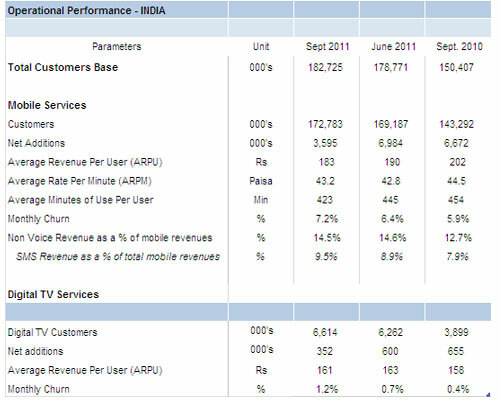 In contrast segment profit from India & South Asia mobile services business declined 6.7 per cent to Rs 1,977.6 crore. Losses from DTH business rose almost 32 per cent to Rs 180.6 crore during the quarter. Profitability of the telemedia and enterprise services businesses also shrunk.